It’s autumn time in the Northeast! Apple Picking time! I love it! This year, I tagged along with Claudine as they introduced the newest member of their family to the wonders of fall. We went up to to Dubois Farms in Highland, NY. It was a small farm and very family oriented. It was actually really nice to be able to park in one spot and be able to walk the entire farm. Unlike the larger more well advertised farms that attract large groups of people, this place was quiet and laid back. Also, the one thing I truely appreciated was that you are charged by pound of what you pick. For a single gal like myself, I can only eat and give away so many apples. Having to fill a pre-purchased bag is difficult. Here I just picked what I needed, and paid for what I picked. 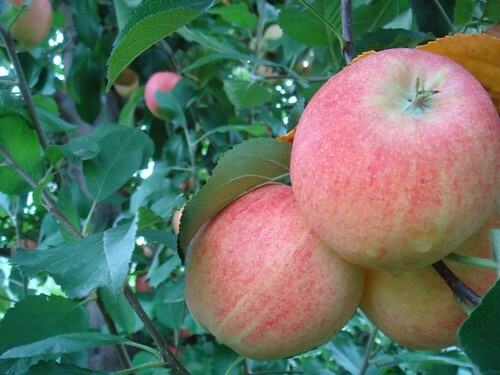 Today, there were Gala apples available as well as Cortland apples. Perfect! One to eat, one to bake with. As we made our way to the cortlandt apples, we also passed the Bosc pear trees, also ripe for picking. They also had Niagara grapes and concord grapes as well. But, I was here for apples (and a pear…for a future post, perhaps). My loot, minus the hello kitty bottle of course! Apples picked, I can now try a new apple dessert I’ve been dying to try. 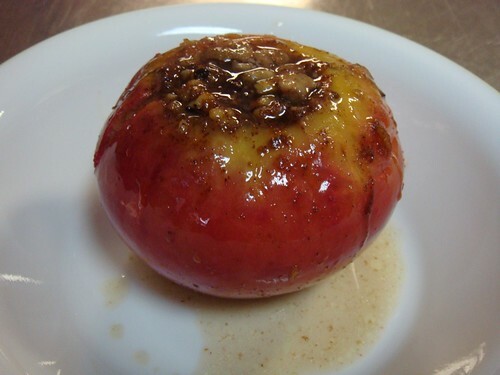 The Baked Apple. Think, apple pie, but no crust. 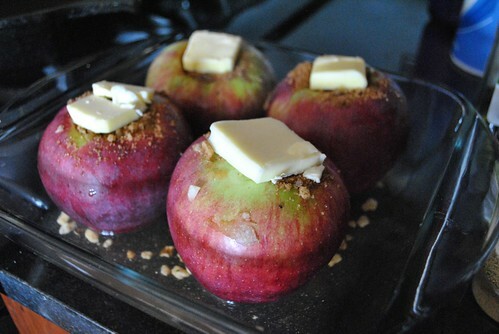 I’d like to think it’s healthier since it’s just an apple stuffed with yumminess and baked. I used my wonderfully large and perfectly sweet and tart Cortland apples. I washed them really good, and then I had to core them. I bought an apple corer last year, but never used it. Now, I need it, and I cannot find it. Go figure. So, I used a knife to first cut out a cone on the top (like you were cutting out the top of a cupcake before filling). 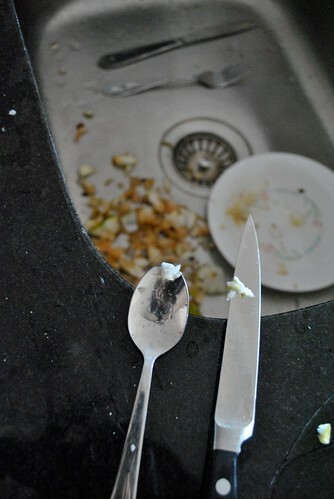 Then I took a teaspoon and started scooping until I got all the seeds out. For my stuffing, I mixed together brown sugar, apple pie spice and walnuts. I didn’t have ground allspice on hand, so I just crushed about a teaspoon between some parchment paper with a rolling pin. I then stuffed each apple, slapped on a slab of butter, put them in a pan with a little hot water and into the oven it went. Simple as apple pie right (without the headache of making the crust)? As I was putting it into the oven, I suddenly realized I forgot the raisins! This is what happens when I bake on the fly, I always forget something! Oh well, it’ll be fine without it. And it was. Since i was in a hurry, I gave it exactly 30 minutes before I pulled them out of the oven and packed them up for travel to my parents house. They were getting soft, but still a bit firm. They could have used an extra 10 minutes. After “resting” for about 30 minutes, I cut one open, and it smelled awesome. It tasted amazing. The brown sugar cut the tartness perfectly, without being too sweet like your eating sugar. 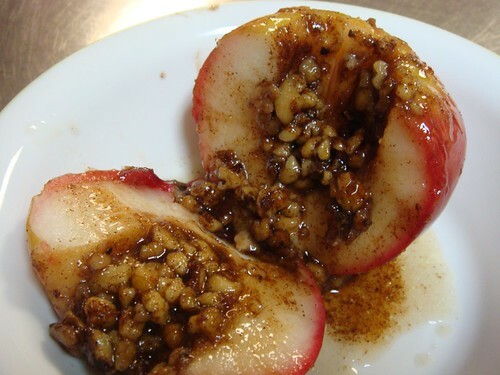 The walnuts gave it a nice contrast in texture to the softer apple. It was very good. I’d make it again, but I’ll try to remember the raisins next time! 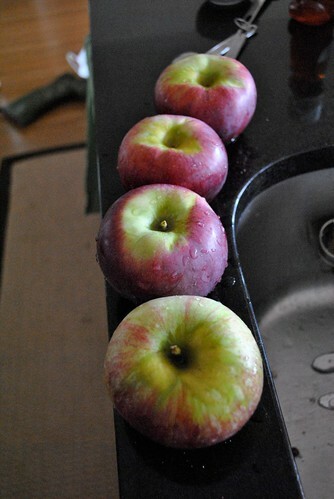 Wash and core apples. Don’t go all the way through. Just dig until you get the seeds out. The bigger the cavity, the more stuffing you can get in. 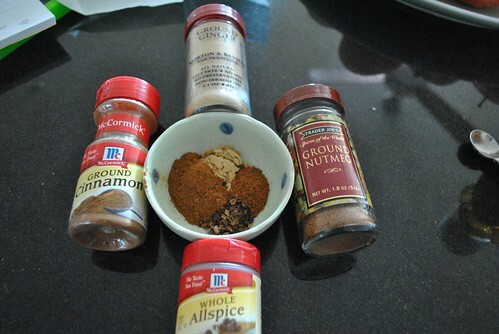 Mix together the brown sugar, apple pie spice, walnuts. If you want to try raisins, add them here too. Maybe cut out a handful of walnuts and sub in a handful of golden raisins (they are sweeter). Pour boiling water into bottom of dish, and place into oven. 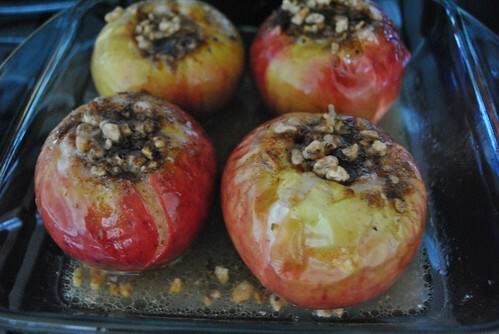 Bake for about 30 minutes, until the apples are soft and slightly firm, but not all out mushy. Baste a few times with the juices at the bottom of the dish. Let it rest a bit, so you don’t burn yourself, and then enjoy! Engineer during normal working hours...photographer, baker, cook, runner, crossfitter and traveler the rest of the time. This entry was posted in Uncategorized and tagged Apples, Dessert. Bookmark the permalink. All photos presented on this blog were shot by me unless otherwise noted.